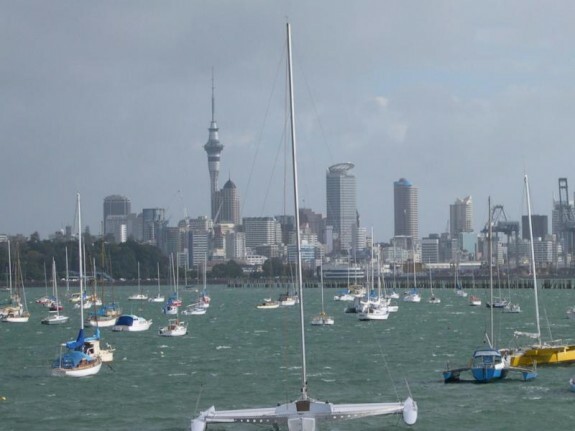 Blog from Auckland, New Zealand | Where's Suzie? 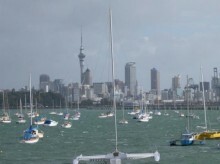 Here's what I got up to for the remainder of my stay in NZ. The last time I was in touch I was waiting in the backpacker place for Dot 'n' Dave to turn up (relatives) yeah? Well they picked me up around 5pm (thank god!!) and we went on a quick v.last minute xmas shopping spree as they'd not done anything due to being busy selling their house. Once we got back to theirs in Te Atatu Peninsula we collapsed and just took it easy for the next 3 days. Their house is located in quite a new development and is right on the water looking across to the city centre. A really lovely location. I woke up on xmas morning to find the house had been decorated and lots of food and goodies on the table (and a cardboard cut out of elvis in a santa hat??). On boxing day we spoke to all you guys back home at mum and dads and Dot started crying when they all starting singing Amazing Grace down the phone (yep, they'd had a few sherbies). We basically spent the next few days eating, sleeping and doing lots of catching up (I was only 14 the last time I'd seen them!!). We went out for a couple of drives around the city and surrounding areas, went for afternoon tea in a posh hotel on 27th and took lots and lots of photos (yes, I will update the site soon with these!!). All in all it was a fantasic few days, really relaxing and they made me feel very at home.